Clay crusher is designed for primary processing of clay material with strength limit under compression up to 40 kg/cm and moisture not more than 30%. Clay crusher consists of a crushing unit in a shape of two blade shafts rotating towards each other (at that, one shaft blades when rotating fit into the grooves between the other shaft blades), rigid frame, receiving hopper and a drive with tooth gear. 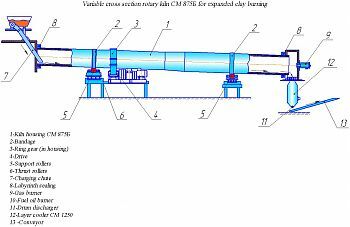 Clay lumps when rotation of blade shafts, going between the blades and ribs on the frame are being crushed. Crusher can be used in keramzit and brick production. Mixer is designed for mixing the crushed clay raw material with various additives. Mixer consists of the mixing assembly unit, a frame, hopper and a drive. Mixing assembly consists of two shafts with blades at rotation of which the blades of one shaft fit into the clearance of the other shaft blades. Shafts are rotating towards each other by means of tooth pinions. The frame is a rigid structure on which the following is mounted: mixing unit, receiving hopper and a drive. Rotating kilns are intended for production of keramzite gravel. Rotating kiln consists of the following main assembly units: cylindrical casing, drives, loading and unloading heads, seals of cold and hot kiln sides, support station, support and thrust station, ring gear pair housing. The casing of rotating kiln is a steel drum consisting of separate sidewalls. Sidewalls thickness at places of tyre installation is increased up to 30 mm. The kiln body is installed on two supports for which special foundations are made. The supports consist of a welded frame and two support rollers the position of which can be adjusted. To control the kiln casing position in longitudinal direction, the support which is near the drive has thrust rollers, the device for kiln rotation stoppage and an alarm on inadmissible kiln axial shifts. Kiln cold end enters the loading head and the hot one – into the unloading head. Heads are equipped with sealing of cold and hot kiln ends for eliminating air inflow. Fuel burner is installed on the discharge head. Sloping grate is mounted in the head lower section for spilling of inflating keramzit. The main drive is designed for kiln rotation during the operation and auxiliary one when firing, cooling, during kiln repair and in emergencies. The main drive consists of open gearing, flexible coupling, drive reducing gear. Auxiliary drive consists of the reducing gear, motor and brake designed for kiln stopping in the required position at repair, lining, erection and other works. Connection of an auxiliary reducing gear with main gear box is executed through cam coupling of free travel owning to which there is a possibility of easy kiln stat-up for fast working rotation from the drive. Kiln is operated according to counter-current principle. Raw material having entered the kiln through the loading head chute is moving to the unloading end of the kiln by means of its slope and rotation. Material when moving is subject to hot gases exposure moving from the burner towards the material. Physical and chemical processes of keramzit formation occur while the material movement in the hot gases zone. Firing of dried gummy granules is the most important processing operation that predetermines in many ways the quality of keramzit gravel and technical and economic performance of the enterprise.